I came home from California last weekend. I brought a few of the chardonnay vines that I rescued. Time to build a chardonnay trellis, which is different than the design I’ll use for the concord and muscadine. I wanted to get the grape vines planted so that they’ll be somewhat established before winter. I don’t have the correct posts and wire but I need to train the vines. 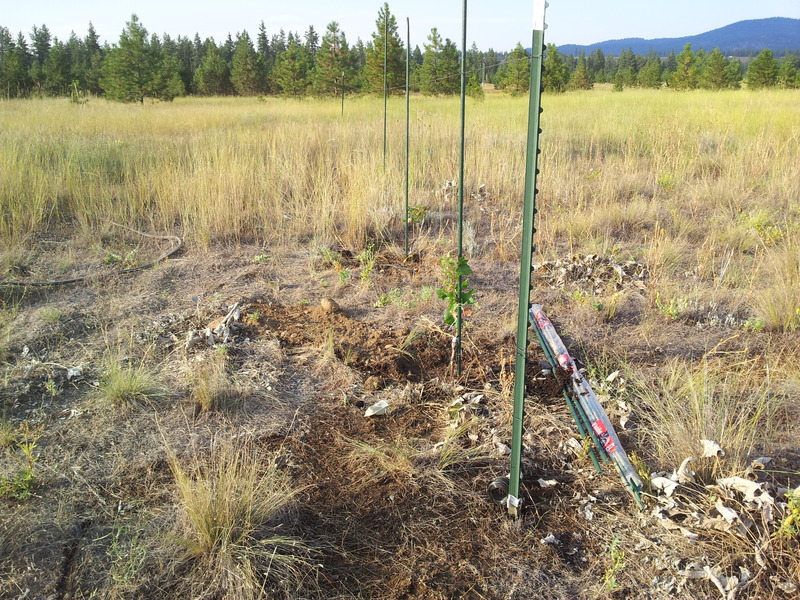 Here’s some improvisation with t-posts and fastener wire (baling wire) to build a temporary chardonnay trellis. 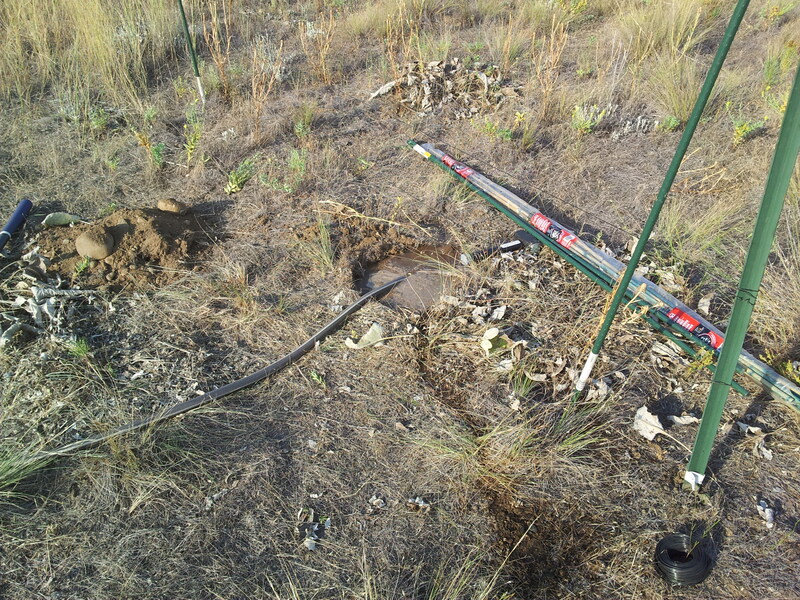 I drove two t-posts into the ground and ran wire at intervals. I wanted the vines 6 feet apart. I’ve seen vineyard where the vines were 3 feet apart and other vineyards that had a 10 foot separation. I want to use vineyard space efficiently. Hopefully the vines won’t be too close together. I started the first hole 3 feet from the post. I measured 6 feet from there and dug another hole. Repeated the measuring and digging. You get the idea. I filled the holes with water and planted the vines. I added the sticks to train them. I secured the sticks to the wires (with more wire). Lastly, I used twist-ties to secure the vines to the sticks. The ties are loose. I’m asking around for vineyard suppliers in the Pacific Northwest. Let me know if you know a good one! I’m looking for the vineyard posts used for vigorous vinifera. They’re metal and wide, with slots on each side. This entry was posted in Plants, Shrubs and Trees, Uncategorized and tagged chardonnay, grape, trellis, vineyard post by admin. Bookmark the permalink.